Last week, when I contemplated writing this blog entry, I intended to title it, “Obstacles and Opportunities.” I often start with a title. 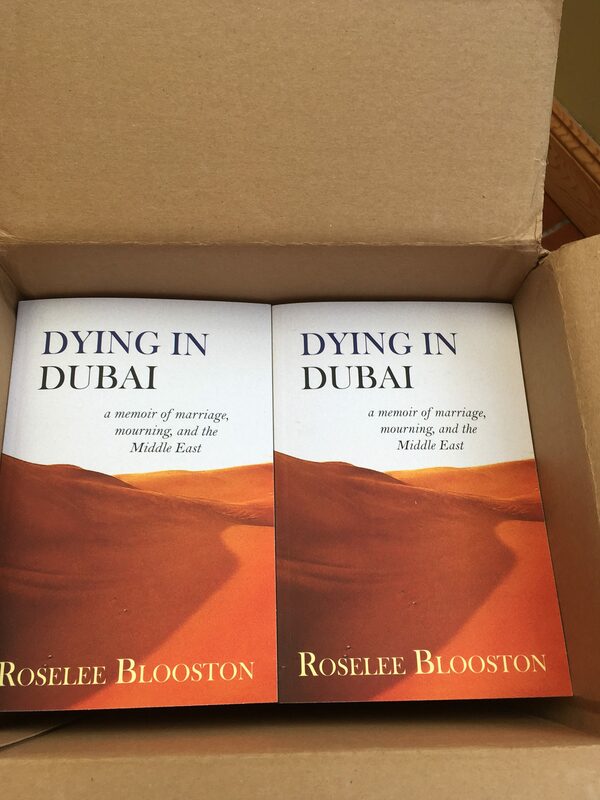 My plays and my memoir, DYING IN DUBAI, began that way. Then two days ago, a box arrived, containing the Advance Review Copies of my memoir—ARCs, as they are known in the industry—and since that moment, and the one mere seconds after, when I sliced through tape and ripped open the cardboard top, to behold two stacks of “the book,” all thoughts of the eight plus years it took to get here, flew from my mind. In that moment, there was only the book in hand. I stood alone, in my sunroom, staring down at the concrete manifestation of my long-awaited dream. The story of my grief and transformation that I had known from the outset could touch and help readers I would never meet, was now a reality, and I was both proud and stunned. For what felt like a long time, but may have been only a minute, I didn’t move. I drank in the cover, which of course I had seen on my screen many times, its three-dimensionality far superior to the flat image. Rarely is an imagined vision perfectly expressed. This was. Gingerly, I lifted out a copy, careful not to bend the edges. I marveled at the size and weighed it, using my hand as scale. Solid. I inhaled the “new book” smell of freshly cut pages. I turned it over and admired the way the front cover’s sand and sky wrapped around to the back and how the blurbs, description, and my photo and bio all fit exactly as I had wished. Tentatively, at arms length, I flipped through the pages, congratulating my early insistence on cream stock—so much softer and easier on the eye than white—but I did not read. I still haven’t. I’m saving that experience for next week, or the week after. My publisher doesn’t need final changes until the end of July. Plenty of time to get used to the idea, to the fact, to the artifact of my labors stored in my study, and in that box. I have read thousands of books in my lifetime; next, I will read my own. What do I think now about the obstacles that littered my path, but ultimately did not deter me: foremost among them, a two-year agent search and the nine months spent with one whose interest turned out to be tepid? I had thought that having an agent was the golden ticket, which was why I spent so long trying to land one, but learned instead that it’s better to have no agent than a bad agent, who would take 15% of any contract, even one I initiated. Weeks before I fired mine, sure that I would, I drew up a list of independent publishers I could approach without an agent. After a summer of re-grouping, I began again, on my own, and got an offer from the first publisher I applied to: a small, non-profit, university press. My goal had been to see the book published, not to self-publish. Years of solo performing, which sometimes involved self-producing, taught me that I needed the undeniable legitimacy of a curated process. The publisher said yes, they would be delighted to publish my memoir, and that was all the validation I needed. The agent had been a necessary obstacle, without which I would not have made my own opportunity. Here I sit, at my desk, an ARC next to my computer, a solid, handsome volume containing my life and my work. Decades of performing gave me many euphoric moments, but life in the theater is all ephemera—by definition, it cannot last. The book exists, on its own, without me, and it could exist long after me. A writer friend pointed out that our books could end up in a yard sale that our grandchildren might come across someday. He meant it as a wonder, a legacy, a gratifying prospect. I agree. So it is with joy and deep satisfaction, that finally, I hold my book in my hand.